For the majority of the Edo period (1600-1868), the Japanese shogunate enforced a policy of isolationism referred to the sakoku policy, codified in the 1630s and ended with Matthew Calbraith Perry’s (1794-1858) high-pressure negotiations to open Japan to Western trade. The sakoku period, however, did not relegate Japan to the status of hermit kingdom: trade was enacted with both China and Korea, as well as with the Ryukyuan and the Ainu peoples (each of whose domains would eventually become annexed by Japan). Of Western powers, however, only the Dutch were permitted to trade with the Japanese, and only on a small artificial island at Nagasaki Harbor. Along with material goods the Japanese imported a great deal of so-called “Dutch Learning” (Rangaku): medicine; astronomy; geography; engineering; and, as LJS 454 demonstrates, naval sciences. LJS 454, Seiyō senpaku zukai 西洋舩舶圖解 (uniform title Gunkan zukai 軍艦図解) is documented innocuously enough in The Lawrence J. Schoenberg Collection of Manuscripts (Philadelphia : Schoenberg Institute for Manuscript Studies, 2013) with the descriptive title “Treatise on how to pack a Dutch merchantship.” It was only this past year that the manuscript was made accessible to the Japanese Studies department, who translated the title slip on the scroll Seiyō senpaku zukai as “An illustrated guide to Western ships”. But neither of these titles hint at the original intent of this work: a practical guide to naval self-defense. In 1792, the Finland-Swede Adam Kirillovich Laxman (1766-1803?) was commissioned by the Russian Empire to return two Japanese castaways to Japan, with the aim of acquiring trading rights from the shogunate. Laxman landed on Hokkaido and was received by the Matsumae clan, the rulers of northernmost fiefdom of the Japanese shogunate centered at Edo (present day Tokyo). While Laxman’s trade concessions were not granted, he was issued documents promising that one Russian ship would be permitted entry at Nagasaki. It would take more than another decade, however, for Russians to attempt to use this travel pass. In the early 1800s, Nikolai Petrovich Rezanov (1764-1807) was commissioned by Tsar Aleksander I to open up trade with Japan at Nagasaki. Despite his attempts to woo the shogunate in 1804, the documents received from the Matsumae clan were not recognized, and Rezanov was sent back to Russia. Embittered by his failure, Rezanov plotted revenge against Japan, and employed two Russian naval officers, Nikolai Khvostov and Gavriil Davydov, to enact his vengeance. The two led a devastating raid on the Japanese settlement at the island of Iturup (whose territory is still in dispute between Japan and Russia today), and at several other points in the Sea of Okhotsk. Along their warpath, Khvostov and Davydov sent a threatening missive in French to the Matsumae clan, warning that further attacks would come if Japan didn’t open itself to Russian trade. Despite the fact that these two officers acted on no official capacity, the shogunate considered this a legitimate threat from the Russian Empire, and the Dutch interpreters at Nagasaki were ordered to expand their skillsets by learning French and Russian. One of the interpreters chosen to learn French was Motoki Shōei 本木正栄 (1767-1822), also called Motoki Shōzaemon 本木庄左衛門. Shōei was the son of Motoki Ryōei (else “Yoshinaga” (1735-1794)), who made a name for himself by translating Dutch books on natural sciences, in particular astronomy. Shōei followed in his father’s footsteps as a Dutch interpreter, and his language skills were advanced enough that he was chosen to act as an official interpreter for Rezanov’s mission to Japan in 1804 (Rezanov himself, however, did not have a positive assessment of Motoki, and requested a new interpreter during negotiations). Besides forming the basis of Motoki’s French studies, the Khvostov and Davydov incident also left the government at Edo nervous about Western naval strength. At the behest of the shogunate, Motoki was chosen to translate critical Western materials into Japanese, including a treatise on Dutch gunnery, a map of the world, and a pictorial guide to Dutch warships. While the exact titles of the original materials are not clear, it is this final item that seems to be the basis of the original text of LJS 454, Gunkan zukai. LJS 454 is one of several manuscript copies of Gunkan zukai extant in the world, and one of the only known copies existing outside of Japan. The variant copies available for inspection show that the textual content remains consistent across extant copies. LJS 454 scroll with title piece “Seiyō senpaku zukai”. The work is broken into three major parts. The first is a general survey of ships, with the section title Gunkan zukai kōrei 軍艦圖解考例 (“Introductory thoughts on illustrations of warships”). This introductory segment is likely the derivation of the title Gunkan zukai, though it is unclear if Motoki intended for his work to be called that. The kōrei is a lengthy discussion of various aspects of ships, including the circumstances leading to the document, the classification and nomenclature of ships, and remarks on the experience of sailing. This section ends with an attribution to Motoki. The next major section is a series of illustrations. Some, like the copy held at the Museum of Sea Sciences (with a closeup of illustration here) in Kotohira, Kanagawa, show finely detailed shading on the illustrations. That copy, incidentally, is reportedly in Motoki’s own hand, and was owned at one time by the revolutionary Sakamoto Ryōma (1836-1867). Other copies, like Penn’s LJS 454 and Waseda University’s copy (fully digitized) have unshaded diagrams. Still other copies, like the one owned by Tokyo Metropolitan Library (available in reprint) have both shaded and unshaded elements. Other variations include levels of rubrication and the order of illustrations. Finally, some copies have clear notations on their date of copying. The copy held at the Nagasaki Prefectural Nagasaki Library (also available in a 1943 reprint) has a copying date of 1842. LJS 454, unfortunately, has no such information to help date it, though it could have been produced no earlier than 1808. The final section is a series of remarks on the methods of nautical warfare, and is ostensibly the purpose for this work, despite it being the shortest section of the three. While Motoki’s work is commonly referred to as Gunkan zukai, again, there is no direct evidence that his document was intended to have that title. 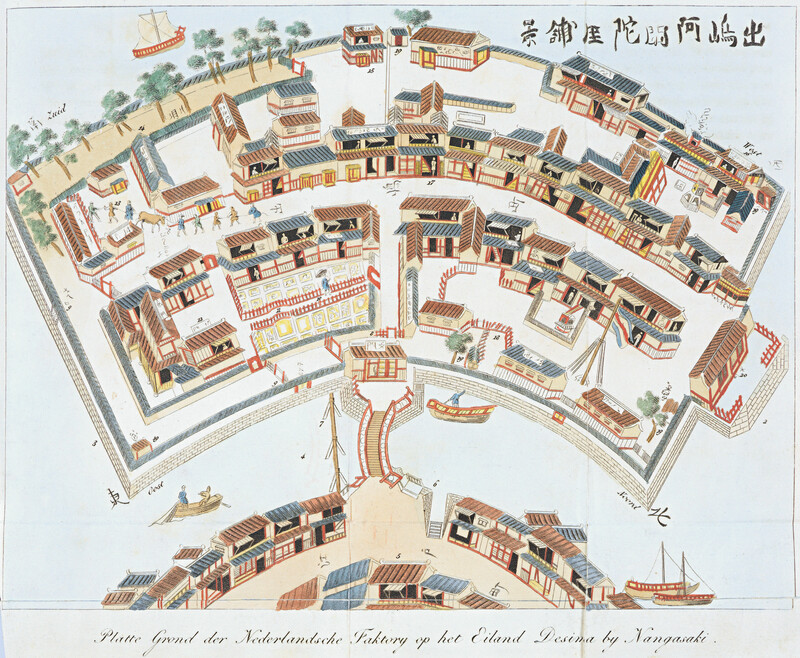 The copy in Kotohira (reported to be in Motoki’s hand) is referred to as Seiyō gunkan kōzō bunkai zusetsu 西洋軍艦構造分解図説 (“A pictorial analysis of the structure of Western warships”). The Union Catalogue of Early Japanese Books (Nihon Kotenseki Sōgō Mokuroku) database, an authoritative source for information on Japanese books, offers the variant title Furansu gunkan kaibōzu 払郎察軍艦解剖図 (“An anatomy of French warships”). LJS 454, meanwhile, has a prominent title piece offering Seiyō senpaku zukai 西洋舩舶圖解 (“An illustrated guide to Western ships”). Saigusa Hiroto and Kodama Reizō, the explicators of the reprinted Nagasaki manuscript, had known of this last title but were unable to verify that it was a variant title of the work Gunkan zukai. LJS 454 confirms their supposition that the works are one and the same. While Motoki is commonly considered the “translator” of this work, in the attribution of LJS 454’s “Introductory thoughts” he is referred to as the yakujutsu 訳述. This is a compound statement of two roles of translator (yaku) and “expressor” (jutsu). In context of Gunkan zukai, yakujutsu might be understood as “creator by way of translation.” Indeed, it appears that Motoki translated and recontextualized several elements of Dutch and possibly French materials to create a new work. The introductory segment of Gunkan zukai (the kōrei) notes publications that served as its foundation, including a specific reference to a diagram published by “Korunerisu Kiri[p]peru” (Cornelis Kribber, active 1739-1780) in Utrecht. While the specific Kribber print is not immediately available for inspection, a likely related print from 1730s Nuremberg shows remarkable similarities to Motoki’s illustrations. Many of these same illustrations appear in L’Art de batir les vaisseaux et d’en perfectionner la construction, originally published in Amsterdam in 1719. This French edition itself seems to be a compilation from earlier Dutch works. While Motoki likely used a source similar to one of these, it is unclear if his translations derived from Dutch sources exclusively or if it drew from French compilations of them. At best, there are unclear references in Motoki’s manuscript notes on compiling Gunkan zukai (held at the Nagasaki City Museum) to a colleague who owned a pictorial guide to Western ships. Comparison of three sundial images. From left to right: 1730 Nuremberg print; Waseda University’s Gunkan zukai; LJS 454. Motoki’s manuscript notes notwithstanding, it is still unclear how many items he used as his source materials, if any were owned by Dutch traders at Nagasaki, and if any were in French. It is also unlikely that Motoki would have acquired significant command of the French language in the months between the Iturup incident in February 1808 and the creation of Gunkan zukai in summer of the same year, though he could have made use of a Dutch/French dictionary on hand at Nagasaki to translate diagrams. While Gunkan zukai may have been commissioned with the intent to protect Japan against Western threats by using Westerners’ knowledge against them, only a few short months after its initial compilation, Japan once again faced a rogue Western commander. In October 1808, the HMS Phaeton under the command of Fleetwood Pellew (1789-1861) entered Nagasaki harbor in an attempt to capture Dutch trading ships, which were now under the authority of the newly Napoleonic “Kingdom of Holland.” In an attempt to fool the Dutch, Pellew flew the Dutch flag on the Phaeton. When several Dutch traders at Nagasaki rowed out to meet this false friend, Pellew revealed the ship’s true colors, capturing the Dutch and threatening to execute them as well as destroy other ships in the harbor. Outgunned, the Nagasaki government gave into Pellew’s demands. With the English now demonstrating a potential threat to Japanese interests, the Japanese government ordered its Dutch interpreters to add English to their list of languages. Once again, Motoki Shōei was tasked with learning a new Western language. Motoki went on to create the first English grammar in Japan, Angeria kōgaku shōsen 諳厄利亞興學小筌 (“A beginning to studying English,” 1811), and later the first Japanese-English dictionary of some 6,000 words, Angeria gorin taisei 諳厄利亞語林大成 (“The complete forest of English,” 1814). He also compiled a Japanese-French dictionary and grammar, Furansu jihan 払郎察辞範 (“A model of French vocabulary”), completed in that same year 1814. While none of these texts became standard texts, they surely served as references for future students of Western languages in Japan. Whether Motoki’s detailed Gunkan zukai was ever used for practical reference is unknown, though with at least seven documented copies in Japan and an eighth here at Penn, it is clear that his work was respected for its invaluable knowledge of 18th century Western maritime culture. Gunkan zukai. Suijōsen setsuryaku 軍艦図解. 水蒸船說略. Edo kagaku koten sōsho 46. Kōwa Shuppan, 1983. Katsumori, Noriko 勝盛典子. “Gunkan zukai” to “Hippokuratesu zō” : Oranda tsūshi Yoshio-ke no bunka bunsei-ki [Gakugeiin no notō kara 65] 「軍艦図解」と「ヒポクラテス像」―阿蘭陀通詞吉雄家の文化・文政期 [学芸員のノートから 65]. [Kōbe Shiritsu] Hakubutsukan dayori 68, p. 6-7, 2000. Loveday, Leo. Language contact in Japan : a sociolinguistic history. Clarendon Press, 1996. March, G. Patrick. Eastern destiny : Russia in Asia and the North Pacific. Praeger, 1996. McOmie, William. From Russia with all due respect : Revisiting the Rezanov Embassy to Japan. The human studies 163, p. A71-A154, December 2007. Sangyō gijutsu hen. Kaijō kōtsū 産業技術篇. 海上交通. Nihon kagaku koten zensho 12. Asahi Shinbunsha, 1943. Tsuzuki, Ichirō 続一郎. Motoki Shōei yakujutsu “Gunkan zukai” to Itō Keisuke yaku “Banpō sōsho gunkan hen yakkō” ni tsuite : Furansugo kotohajime no kanren 本木正栄訳述の「軍艦図解」と伊藤圭介訳「萬宝叢書軍艦篇訳稿」について―フランス語事始との関連. Rangaku shiryō kenkyū 307, p. 117-133, 1976. Categories: Manuscript Research, Uncategorized | Tags: diplomatic history, Dutch, 軍艦図解, Gunkan zukai, Japan, Japanese manuscripts, LJS454, Motoki Shoei, Motoki Shozaemon, Nagasaki, naval sciences, Rangaku, shipbuilding, 本木庄左衛門, 本木正栄 | Permalink.